Winter is not the only time of the year that we should take extra care not to catch a cold, but it is the main one. We spend a lot of time in confined spaces, with doors and windows tightly closed. Consequently germs having no way to escape. It's only a matter of time before someone gets sick. With winter fast approaching, the following question seems to trouble the dog owners community, "Can dogs get the flu?" While there are differences in the types of viruses that affect humans against dogs, the symptoms are about the same: sneezing, coughing, runny nose. 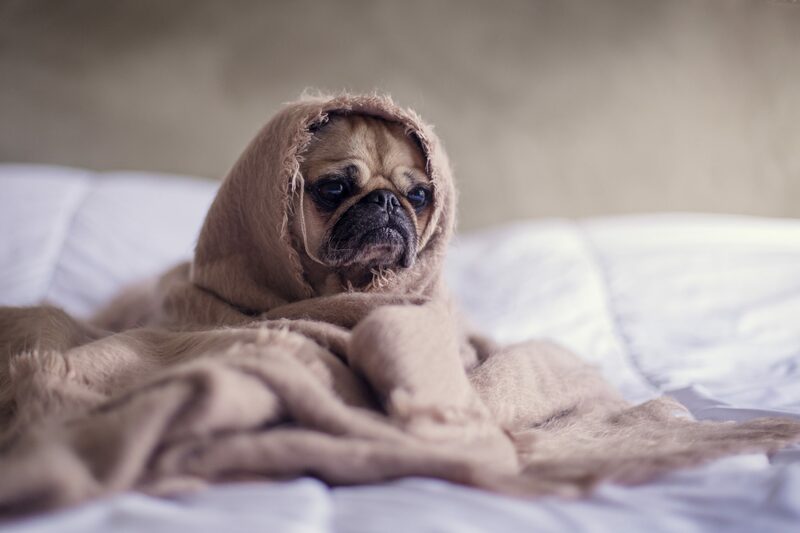 What can you do to protect your dog from the cold, or if your dog gets the flu, what can you do to help him recover? Can dogs get the flu? Yes! As mentioned above, a dog cold is different from that of humans. The disease is not transmitted between different species - or at least, it has not yet been established - hence there is no reason to worry about catching your dog's cold or vice versa. You should separate a common cold from another more serious health issue. A common cause of a dry cough is a condition known as the kennel cough. This contagious type of cough is usually picked up in a clinic or other care facility. This cough is recognizable by the characteristic sound that sounds like a choking. If your dog was recently hosted somewhere or came into contact with another dog that was hosted, this should be taken into account and a veterinarian's opinion could be helpful. There are other highly contagious cold-like diseases that one needs to identify. Influenza, adenovirus, and tuberculosis are diseases transmitted by infected dogs. Another disease that can put your dog's life at risk is the CDV virus (canine distemper virus). A dog with symptoms of this virus usually has a cough, vomiting, high fever and many secretions of eyes and nose. There are many types of parasites that can get into the lungs, heart, and trachea. Those can cause symptoms that resemble a respiratory infection. Coughing and other breathing problems are the main symptoms. Mycosis is equally common in dogs, and can even threaten their life when the parasite creates foci in the lungs. This can cause continuous, recurring coughing, lung tissue injury and eventually pneumonia, in some cases. More difficult to identify, but equally common in animals as humans is allergy due to environmental factors and/or food products. A form of undiagnosed asthma or allergies that show respiratory symptoms can also cause coughing and sneezing in dogs. If your dog coughs or sneezes but generally looks good, you can act as if it is a simple human cold, with lots of liquid, healthy food (even chicken soup, of course! As long as you remove the bones!) heat, even some time in a warm and damp room. You can do this by placing a humidifier near the dog resting area. Filling the bathtub with hot water and leaving the dog in the bathroom for a while (outside the tub!) Simply by letting the steam soften and liquefy secretions of the nose and lungs. It is important to note that while most respiratory problems begin to improve within a few days of the onset of the symptoms, the immune system of some dogs is not ready to cope with an infection, and may need treatment with antibiotics or other medications to recover fully. If your dog is either too young or very old, you should consider visiting the veterinarian as dogs of these ages tend to have a weak immune system and suffer more. You can prevent a possible cold by keeping the dog in the house when it is cold and wet outside. Of course, it is not the low temperature that causes the disease, but overexposure to adverse temperatures. Such environments may be the ideal conditions that will facilitate a bacterial or viral germ to spread and occupy the animal's body. Additionally, ensuring that the body is in the healthiest condition is the main prevention method for all diseases. Give your dog a lot of fresh water. Even if there is water in the bowl, you should change it at least once a day. Ideally, you always try to offer him healthy food so that the immune system can face any microbe occurring. Your dog will then have the power to exercise at a level normal for his age and race. If your dog is a breed that usually has breathing problems (e.g. pugs), your vet may suggest that you permanently have a humidifier where the dog sleeps. Finally, it can be quite problematic to have a sick animal at home. Of course, you will not want a home full of sick dogs. While your dog is sick, keep him away from the other dogs so that the infection does not spread. If the symptoms do not improve or appear to get worse, consult your veterinarian.